Will the real Pakistan please stand up? The lecture was followed by an observing session. 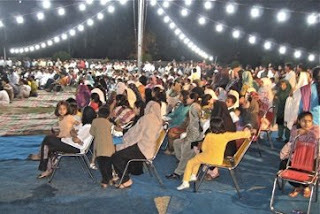 See more pictures and details of the event at this blog by Umair Asim. By the way, I have a question (and a minor quibble): The night-time session looks great as a picture - but why are all the lights on?? I guess, images from the telescope were projected on the screen - and perhaps that did not require complete darkness. Hmm...but still too many lights (See couple of more pictures below. But you will get a better feel for the event from Umair's report). Glad to read that. Hope more people come out and attend such events. 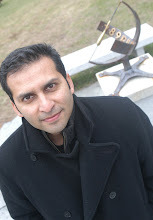 Umair's relentless efforts are highly appreciable. Thanks for bringing up positive side of Pakistan. 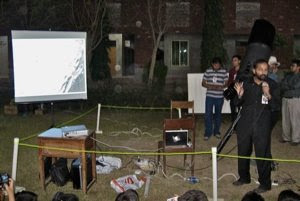 I attended an earlier KSS astronomy event in Lahore. Very enjoyable and informative. Yes a lot of bright lights there..and Salman is right, the projected images (Moon and Saturn) were very bright indeed and there was no problem in figuring out the details. The bands on the planet were clearly visible.